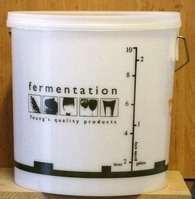 A 10 ltr brewing bin which is ideal for making small batches of beer or wine. This is a 10ltr capacity brewing bin complete with a lid which is ideal for making small batches of beer or wine. It can also be used to hold the "must" during the early stage of country wine making when the ingredients are steeped in water for a few days before syphoning the liquid into a 5ltr bucket or demijohn prior to the addition of the yeast. The outside of the brewing bin is normally marked in both litres and gallons as recipes and beer kit instructions tend to use pints and gallons whilst wine kits tend to use litres, however the graduations are for guidance only and should not be relied upon to be absolutely accurate. Whilst it is also small enough to be used as a floating mash tun when making batches of all grain beer upto 25ltrs in size, care should be taken if using it for this purpose as the handles will soften slightly in the water bath and the weight of the grain mix MAY cause the handles to slip out of their mounting points. The diameter of our standard 10ltr Youngs bin is approximately 27cm, the overall width (including the handles) is approximately 29cm and the overall height (including the lid) is approximately 27cm.